A sort of dog version of Garfield meets Grumpy Cat, the pooch looks perpetually aggrieved. 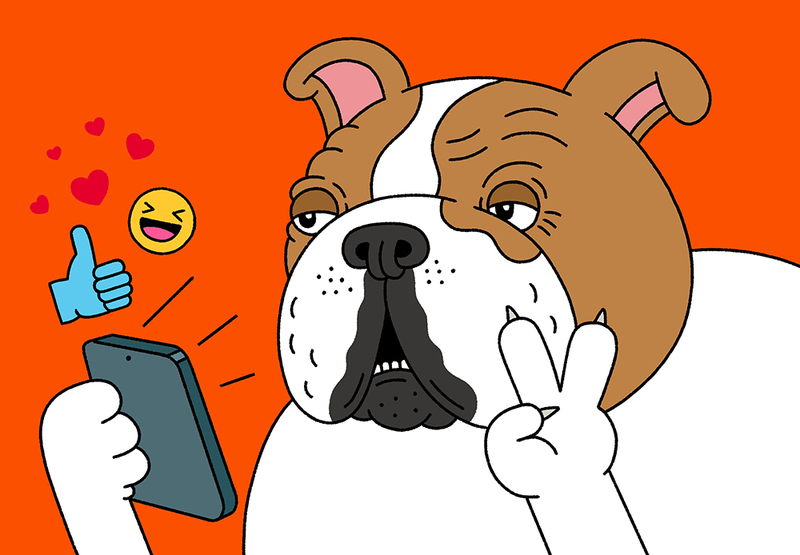 Five-figure engagement is not only unusual for a pet IG account, it is something the lead New York Times tech writer, Brian Chen, failed to do when he attempted, in December, to game the platform and make his own dog a star. Unlike Chen, Rich does not sweeten photos or buy followers or use much video. She simply snaps amateur pics—“I have zero photographic skills” she insists—and adds funny, family-friendly captions. It is perhaps Rich’s sweet, authentic, non-needy approach that has resonated most with fans. “There’s no trick to it,” she says. “It’s just engaging with other people. I only follow about 227 other accounts, almost all bulldogs, because that’s all I can read every day and comment on.” In doing so, Rich has beat myriad wannabes angling to achieve influencer status. Harrison’s stardom has resulted in gifts of free pet beds and tchotchkes bearing his miffed-looking face. “I’m not sure we want to become paid influencers,” says Rich, who has rebuffed many offers of commercial placement. She would rather wield the dog’s popularity for local good—such as a benefit for Queen City Bulldog Rescue this past fall, which raised $1,000.